and war veteran with a long, distinguished resume doing contract work and under his own Airship 27 publishing banner. 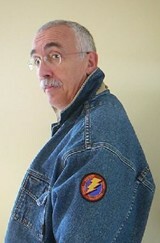 I was introduced to Ron by Rob Fitz, my most recent interview, who is attached to direct my micro-budget film BLESSID. But you’ll find more about that later (in question 12, to be exact). For now, put down your pencil and take heed of a REAL writer. Meet Ron Fortier – a creator force you’ve read many times before, but may not have known it! 1) You are sort of a comics/pulp Renaissance man – you write, edit, publish, critique and even lecture on all things sequential art and pulp fiction related. You even write plays and screenplays. What is your true love … or do you have many creative mistresses? (RF:) I guess, when all is said and done, my true love remains comic writing. There is really nothing else quite like it for me. The opportunity to meld my vision with that of a visual storyteller is always a rush and makes me feel like a kid every time I finish a new comic project. 2) Your website is “Airship 27”. 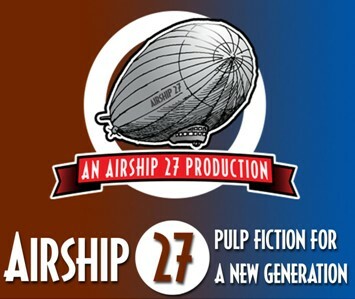 What exactly is “Airship 27” and “Airship 27 Productions”? (RF:) Airship 27 Productions is a publishing house created by yours truly and artist Rob Davis almost seven years ago to produce brand new novels and anthologies featuring public domain pulp heroes from the 1930s and 40s. Since beginning operations we’ve grown to having over fifty titles in our current catalog. 3) Where did you get your training or were you self taught? (RF:) Well, I do have a Bachelor of Science degree in Business Administration, which proves I went to college. Chuckle. And while there, I did take various writing courses. But alas, back in my time comic scripting was considered less than legitimate literature and no one taught it. So I learned on-the-job, if you will, with the aid of a tiny little booklet written by Nick Cuti called, “How To Write Comics,” and sold by the old Charlton Comics group for .50 cents. Over the years I would later pick up how-to-titles from various outfits like Marvel and DC, but overall, again, it was learn by doing. 4) What did you read as a child and young adult growing up? (RF:) I actually learned to read from comics and they opened my imagination at a very early age so that by the time I was ten, or eleven, I’d moved on to reading racy private eye paperbacks and adventure novels. I discovered Edgar Rice Burroughs paperbacks while in high school and soon after reprints of the pulp heroes Doc Savage and the Shadow. By the time I graduated, I was hooked on all manner of fantastic lit from fantasy to sci-fi and horror. 5) Favorite film, favorite graphic novel and favorite pulp fiction novel … and why? Favorite movie is the original 1933 King Kong; a film so rich in imagination it explodes off the screen in every single scene. The direction is taunt, the FX ground-breaking and the music score revolutionized music making in Hollywood. Add to it a tragic tale of innocence lost and it makes me cry every single time I watch it. Graphic novel is a little tougher, but I have to choose CAMELOT 3000 (though it began its life as a mini series from DC). Writer Mike Barr took the iconic King Arthur legend and turned it on its ear into an amazing sci-fi epic unlike anything ever released before it. Alan Davis’ artwork was jaw dropping beautiful. A true comic classic. Finally, without a doubt, my favorite pulp novel was the first ever Doc Savage novel, MAN OF BRONZE by the great Lester Dent. In that one book is all the action, thrills, colorful characters and exotic settings that would come to symbolize pulp fiction. 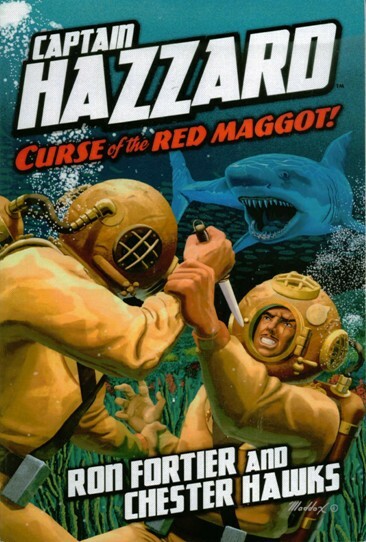 I’ve read lots of pulps since discovering that paperback reprint, but none ever wowed me like that one. 6) What was your first “big break” in the industry? (RF:) My first published comic shorts appeared in Charlton Comics in the late 1970s. 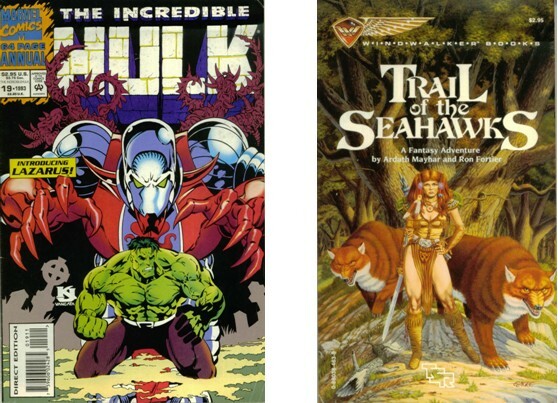 Both were illustrated by my dear pal, artist Gary Kato. It was our first crack in the pro-door. We later followed it up with a five issue mini-series called STREET-FIGHTER from Ocean Comics, a little outfit located inRhode Island. That propelled me toSan Diegoin the 80s were I would land bigger gigs. 7) Name the work – or works – that you have written that impresses people the most at cocktail parties? 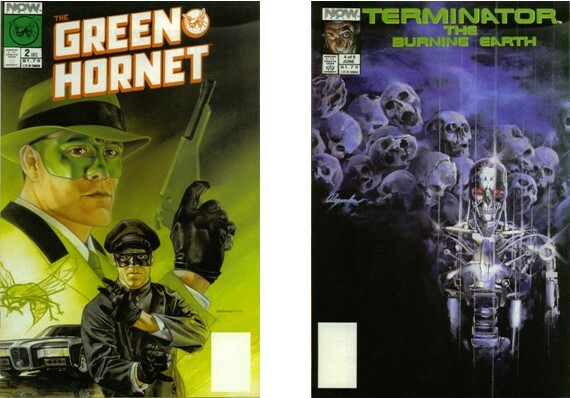 (RF:) My two and a half year run on Now Comics THE GREEN HORNET. 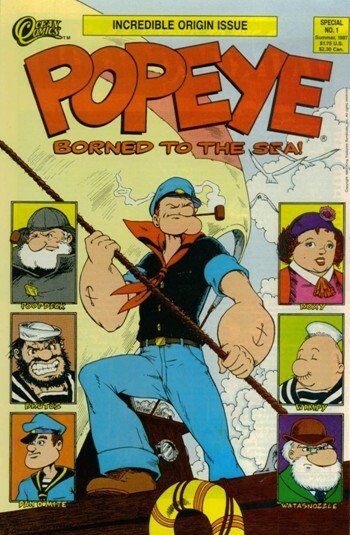 Up until that series, the character had not been seen in comics in over twenty years. It was easily the company’s most successful series. Then shortly before leaving them, I wrote a five-issue Terminator series called THE BURNING EARTH which was illustrated by this new kid named Alex Ross. It was his first comics work ever. Wonder what ever happened to him? Ha. 8) What have you written that is absolutely fantastic that has not been published, filmed or theatrically staged yet? In other words, your greatest “undiscovered treasure”? (RF:) THE EIGHT WONDER OF THE WORLD, my movie screenplay that tells the story of how two World War One buddies, Meriem C. Cooper and Ernest Shoedstack started their own documentary company after the war and became filmmakers. Years later, they would both end up at RKO and team up with special effects guru, Willis O’Brien to produce KING KONG. Honestly, the story of their lives and how this movie got made is just as exciting as the picture itself, except its all true. One of these days I hope to turn it into a graphic novel and hope it gets some attention. 9) You’ve worked on books for the Hulk, Popeye, Rambo, the Terminator, Green Hornet and even Peter Pan. Which one would be last standing in a brawl? Which would you want to have your back in a foxhole. And which character do you admire the most? (RF:) Okay, so let’s get wacky here. Last man standing would be Popeye. Nobody in this bunch could whip that one-eyed sailor man. Who would I want with me in a foxhole? Easy again, being a Vietnam vet myself, that would be Rambo. I have so much respect for Green Berets, even the Hollywood kind. And my personal hero is Britt Reid, the Green Hornet. He’s a wealthy man with all the good things money can buy and yet his conscience won’t allow him to enjoy his life while criminals continue to victimize his city. His donning the mask to disguise himself as an outlaw to battle them is not some foolish, cavalier gesture but a true sacrifice putting himself on the line for others. To me that’s what a hero is. 10) Tell us about your blog “Pulp Fiction Reviews”. How long have you been at this, and how much time do you devote to it each week? And oh yeah … read any great books lately? (RF:) Years ago a colleague told me the one thing I’d most likely have to give up when becoming a professional writer would be reading. The logic being you simply can’t do both at the same time. Not happy with that idea, I promised myself I would never stop reading, no matter how busy my life became and purposely started a review blog to make that happen. It’s been up almost six year now and I’ve lost track of how many books I’ve reviewed in that time. As for exceptional books thus far this year, let me strongly recommend two: “Destiny of Fu Manchu,” by William Patrick Maynard and “Dossouye – Dancers of Mulukau,” by Charles Saunders. Both great reads. 11) The late great comedian Johnny Carson once said in an interview that his epitaph would read: “Here’s Johnny!” As a writer, what will your epitaph say many, many years from today? 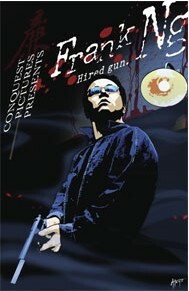 12) You did a prequel for the indie cult Chinese action horror film “God of Vampires” called “Frank NG – Hired Gun”. The comic sold quite well on Comixpress. How did you get involved in that little project, and whatever happened with it? still very much available at the ComicXpress site if anyone is interested in grabbing a copy. 13) What are you working on today? (RF:) Now there’s a loaded question. I’m in the middle of my fifth Captain Hazzard. At the same time I’m also committed to writing half a dozen pulp short stories for other publishers, to include Moonstone Books & Pro Se Productions. Plus, as ever, editing another half dozen books we at Airship 27 hope to get out before the end of the year. Busy doesn’t begin to describe it. (RF:) Hey, after working 30 years in a GE Factory (the day job) my wife and I actually did retire almost ten years ago now allowing me to devote all my time, when not with our six grand kids, to writing. And they have been the most ten productive years of my career. I doubt seriously I could ever stop. Writing is in my blood. (RF:) Thank you, Bob, this has been fun.